Bill Beaty's at it again! Our favorite crackpot physicist presents a backyard solution to that emergency need for cryogenic fluid. Sometimes you can't wait to freeze daisies. Recipe: dry ice, soda bottles, and rubbing alcohol. The alcohol does not freeze to solid state. 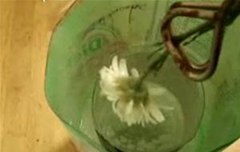 Instead, the dry ice (frozen CO2) supercools the alcohol creating a bath that can freeze a flower in seconds. Be careful: this stuff sticks. Bill describes this homebrew as cryogenic napalm. So, heed his warnings, or risk losing your finger(s). Also, don't eat the flower after you've bathed it. Frozen = inedible. You Sir, are an IDIOT. You didn't "freeze" anything. Except maybe your chance for any sort of career enhancement, based of the field of science. Did you even bother to review your video before posting it for the world to see what a moron you are ? That was a rhetorical question, dude. can you expand on your comment? i'm not sure what angle you're coming from. It's not liquid nitrogen, but it does supercool the flower. should have reviewed his video before posting -- and in doing so, he should have been embarrassed enough by his performance to NOT post his product. yes, thank you. i could definitely have used some more theatrics and longer saturation in the alcohol. i really like Bill Beaty's work though. He's the guy who did 'cavitation' That video is amazing and he checks out as a science fanatic / chem teacher. i can't argue this video is disappointing though. thanks for the answers. What do u mean it didn't freeze? Can you be any more disrespectful, god ur the idiot. He Said it wasnt liquid nitrogen so it wont freeze as instantly or thoroughly and wont shatter as if it was (this is the reason this hasnt replaced Liquid Nitrogen) but it is effective to a degree and useful so SHUT UP! i'm gona try this. is the rubbing alcohol conductive? lol i'm gona try to make a computer cooling thingy, like the one using the olive oil. what is the temperature of the alcohol after cooling?? I don't know if with this procedure you can make liquid nitrogen, but the things that he "froze", where not at least cooled. Hitting the leaves and the flowers hard, will result in their destruction even if they are not frozen. If anyone has tried that, let me know. Very easy, simple and fun ! until what time can the home made liquid nitrogen work? or can it still work even if it has already passed a day? ahmm... wer can i get d summarize of dat????????? First off i'm not going to verify all temps sorry. Dry ice is around -79c, Isopropyl's freezing point is around -90C I think SO when you put the alcohol and the ice together you can cool the alcohol solution to almost -79C, hence why it's not liquid nitrogen and it takes longer to freeze items than nitrogen would. The reason why you don't use 70% vs 99% is that the water in 70% attempts to freeze and that causes the alcohol solution to gel up. So it would work, but he gave good warnings. You can really hurt yourself with supercooled alcohol. I wonder if instead using rubbing alchohol ..could you use 100proof vodka? Hmm perfect for making icecream?